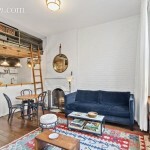 This is not your average studio apartment. For starters, it’s located inside a brownstone at 405 West 21st Street, in Chelsea. (The five-story property has actually been split into 12 different apartments.) It is also lofted, to create some more space in the otherwise cozy apartment. And a beautiful wall of casement windows brings in tons of light. 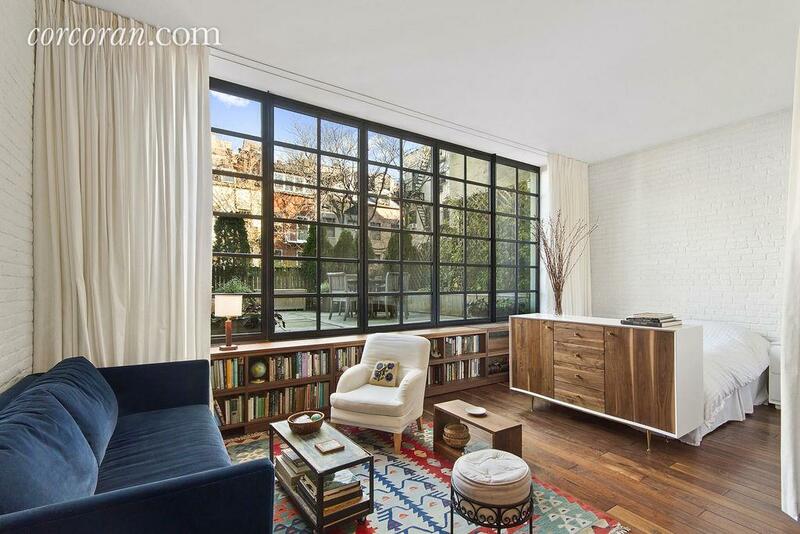 But the big perk of this studio is that those windows look out onto private outdoor space, which is definitely not a typical offering of a tiny pad. This lovely private patio, which looks out onto the surrounding townhouses, adds an extra 400 square feet. All this—including the fact that it’s furnished—makes for quite the pricy studio apartment, at $4,500 a month. The striking wall of casement windows is a new addition to the apartment. It looks out north, onto the private terrace. It also completely accentuates the sense of size within the unit, which comes in at 550 square feet. And the loft—which is accessed by a ladder—offers some extra room for storage. If you’re in love with the furniture and decor, don’t worry because it’s not going anywhere! This rental is being offered as a short-term, furnished space. The furniture goes well with the interior design, which was revamped recently and includes hardwood floors, painted exposed brick and reclaimed wood detailing. The downstairs area is large enough for an open kitchen, which looks out onto a bed, couch and small dining room table. Behind the curtains in the sleeping area, there are floor-to-ceiling closets and a washer and dryer. 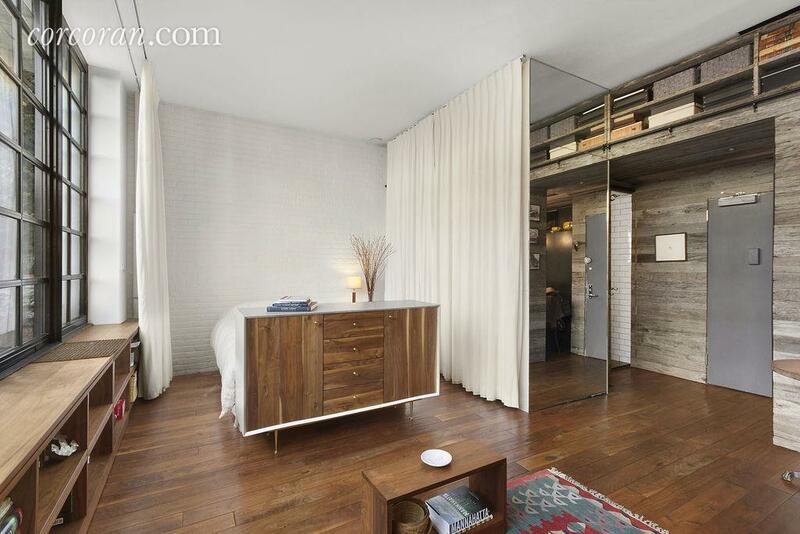 We also like that floor-to-ceiling mirror you see as you walk out the door. 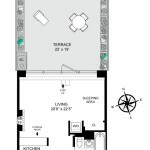 The kitchen (not pictured in the listing) comes with bar-height countertops for some extra seating. Another good way to maximize space! The bathroom (also not pictured) comes with floor-to-ceiling subway tiling and a claw foot tub with high-end fixtures, according to the listing. 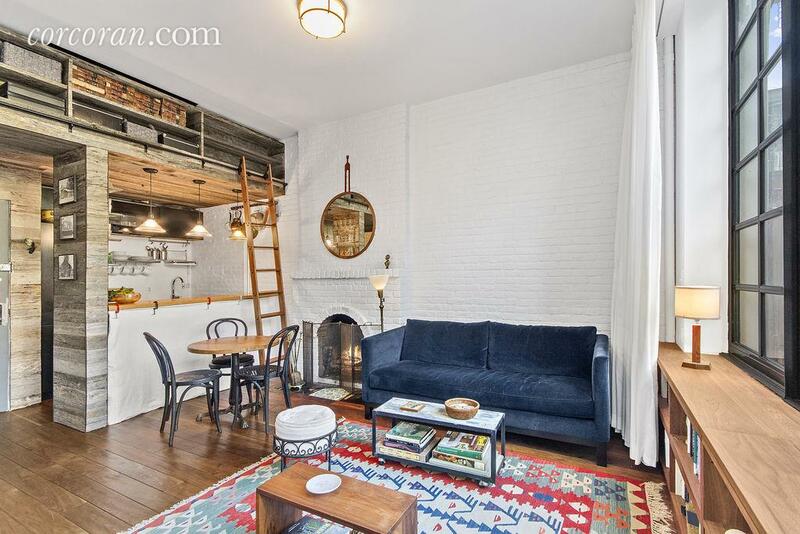 And finally, the private terrace, which adds an extra 400 square feet to this rental. 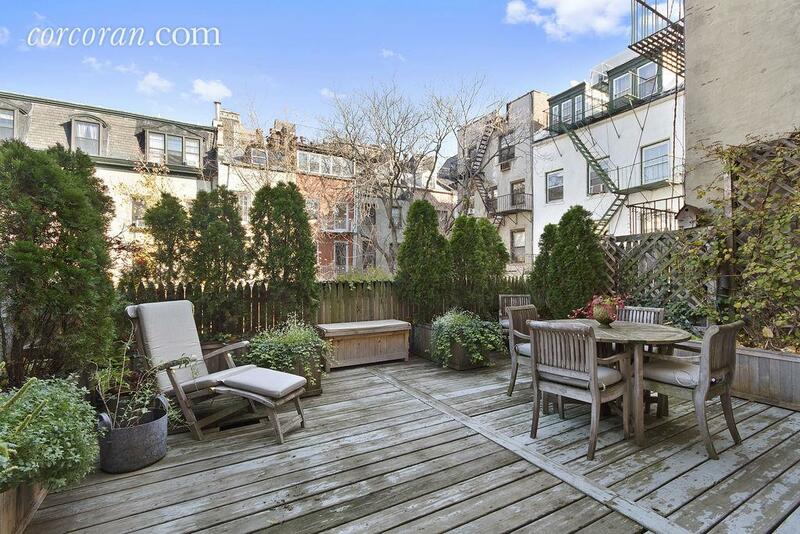 It’s a landscaped wood terrace with views of the surrounding brownstones. Really, could a studio get any better than this?